Although modern in its operation, the Dimplex Heritage Electric Stove has a charming, old-fashioned style resembling cast-iron stoves of the past. As a welcome addition to your kitchen or living room, this stove provides heat and ambiance in an instant. Patented flame technology creates an incredibly realistic flame effect, while stay-cool glass keeps children and pets safe from burns. 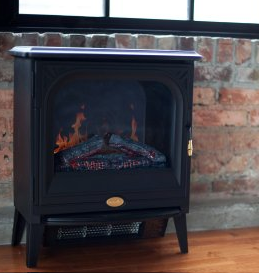 This compact electric stove kicks out 5,115 BTUs of supplemental heat for up to 400 square feet. A convenient remote control allows you to adjust the unit from anywhere in the room. Includes 1-year manufacturer's warranty. This electric stove requires no piping or venting and operates on pennies per day. All you have to do is plug it into a standard household outlet, and you'll experience beautiful dancing flames, cheerful ambiance, and an efficient heat source. An automatic safety shut-off will shut it down should it overheat. The quality of this Dimplex electric fireplace is backed by a one-year limited manufacturer's warranty. Dimplex electric stoves are designed to operate with little environmental impact. No combustion means no greenhouse gases, which will give you peace of mind as you enjoy its benefits in your home. The stove itself is 100% energy-efficient and distributes heat evenly and quietly. As Summer is winding down in the Northeast part of the country, the inevitable cool temperatures that Fall usher in, are only a few short weeks away now (my goodness, where does the time go?!). The cool breezes and changing leaves will shortly thereafter give way to the frigid temperatures and (dare I say it?) snow, that Winter brings! We having been slowly preparing for the change of season by getting some painting done, and adding a few odds and ends to our family room & play room to help ensure comfort during the long Winter season spent largely indoors. Adding a glowing ambiance and warmth to our family room will be effortless this season with the Dimplex Heritage Electric Stove from Hayneedle! The charming design of the stove fits in seemlessly with the decor in our home, and definitely adds a touch of Old World charm. Setup is super simple, and takes only a few quick minutes as it arrives partially assembled (tools required: Phillips screwdriver). The included remote control allows us to operate and adjust the warmth to our comfort level from anywhere in the room. My expectations for the realistic presentation were more than met! The flickering flames and crackling embers are as close to a real fire as it gets (without actually having a real fire). .
Offering a great alternative to a traditional fireplace, the Dimplex Heritage Electric Stove operates on just pennies a day! Cost efficient & GORGEOUS! What more can a gal ask for?! In a sea of retailer sameness, Hayneedle provides true variety and real selection. At Hayneedle.com we don't believe in limits, we believe in giving you options, selection, and an incredibly easy way to shop all of our stores with one shopping cart. We're here to make sure you find what you love and love what you find....for home, work, and play. Add Warmth and Ambiance to your home this Fall! One Lucky Reader Will Receive a Dimplex Heritage Electric Stove! (RV $179!). Leave a comment~ Visit http://www.hayneedle.com/ and let me know which item you would love to add to your home decor this Fall. The comment is considered your entry. thanks much! love the stove too and have two places that would work in our home! GFC'd and I'd love to change out the lighting in my kitchen to something like this! entered your Family Travel Guide giveaway! entered your Hannspree giveaway too! entered your Nivea giveaway too! entered your Build a Dream playhouse giveaway too! entered your Red Baron giveaway! Patina Evening Sky 31-Inch Fire Pit Set. It would be just the thing to take the chill out and brighten up the night on my Florida patio once those winter cold snaps start arriving!